Last weekend we visited the Hoorn's Cache Event. We arrived early, to have enough time to built up our booth. We had a long day and lots of happy people coming and going in the event area and had a lot of fun. We also sold the HCE 2012 Geocoin. It is alomst sold out. A few remaing geocoins can be found on our website. We are already preparing for coming weekend, the ACE event in Hengelo (gld) for which we also made the event Geocoin. Next month we have two events outside the Netherlands: on 7 april we will be with a booth on the Dosenfisher event in Dortmund, a mega event with already over 1400 will attends! The week after, we will be at the Brugse Beer II event in Brugges. A beautiful Geocoin in the Easter Egg shape. With glitterenamel on the front and a 3D picture of elves on the back, in antique silver. A new Easter Egg geocoin. This coin features numerous Swarovski gemstones and translucent colors. Delicate design work with 24k gold plating. This is the first coin of a serie for the next few years, so start your collection with this coin. This Signal the frog, Faberge Easter Egg geocoin features numerous Swarovski gemstones and translucent colors. Delicate design work with 24k gold plating. Avaialble at monday march 26th. Last weekend we visited the HCE 2012 in Hoorn. A great event! There are a few of these unique geocoins left: in polished gold (45 made) and black nickel (30 made). This coin is not really new, but was long sold out. We have some new stock on the antique bronze and antique silver edition. The design of this Geocoin is by "Mambo"
The designer of this coin has always been a huge Science Fiction fan. He grew up with all the great TV shows in the 60’s, 70’s and 80’s and really loved the original Battle Star Galactica series and have been catching up on the newer versions. This coin was based on that serie. You can coins find these and other coins at our website in New geocoins. We all need personal holders that will ensure mobility and continuous connectivity in our personal and professional lives: quality products that will secure our cell phone and other valuables in a convenient, sleek format that can be worn for a variety of activities. Keep phone, music and valuables secure. KangaTek's products make it possible for you to carry important possessions and devices close to your body and where you can reach them, without dealing with bulky bags or inconvenient clothing pockets. Our holders provide a good balance - ease of carrying, quick access and security - to keep you moving, productive and connected. 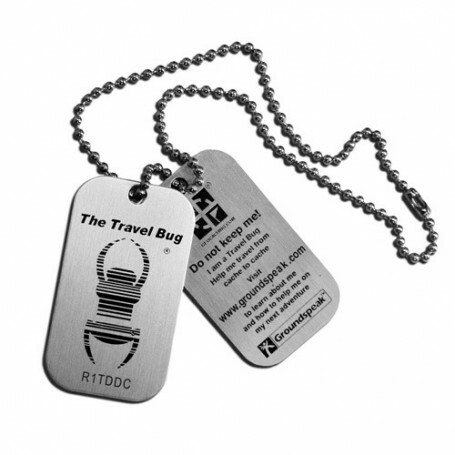 You can find these and other travel bug products at our website in Trackables. The Velcro fastener Geocaching.com patch. A beautiful item for your geocaching wear. Cord it on your t-shirt, bag or jacket. You can find these and other goodies at our website in Goodies. Available in full-color print and black and white print. You can find these and other cloting at our website in Caps & clothing. Mist u iets van Groundspeak? Mocht u interesse hebben in Groundspeak artikelen die wij niet op onze site hebben, neem dan even contact met ons op, dan kunnen wij het bij een volgende bestelling mee laten komen. Do you still have question, please send an email to: info@geocachingshop.nl.